This is the same shape as used for Brown Stone posted on gallery recently. Gosh my first thoughts was that the ensignia was the Royal New Zealand Navy .....? Can you confirm that it is the NZ Police Force ensignia Jonno? There are so many letters intertwined it's got me fooled! Yes can confirm saw the actual ensignia on hats on Wednesday when I attended the long service medal presentations at the Town Hall, our first born was a recipient. The nearest the Navy got was that their very excellent band was playing. Perhaps this insignia is for a special branch of the Police ? As the current one shows a simple NZP intertwined, unlike this one that has so many letters.. I will see if my contacts can decipher and perhaps let us have a date. It may be the Police College or just an older version of the insignia. Have sent a copy to the Police museum asking for their comments, will let you know. I checked out a government site that supposedly had all of the old Police insignia ... but I couldn't find this one anywhere. Oh and a different shaped pepper shaker with a backstamp ..... so can be dated! Oh wow .... another shape pepper shaker .... same logo! How interesting! And yet another listing ... doesn't rain but it pours .... RNZAF they think? Haven't heard back yet from the RNZAF museum but there is no doubt whatsoever that my plate IS NOT NZ Police. Amazing how one piece seems to be quite rare and then a collection will turn up. It is now official. The RNZAF museum confirms that this style with the orange outer line was for NCO's and enlisted Aircraftmen & Women. 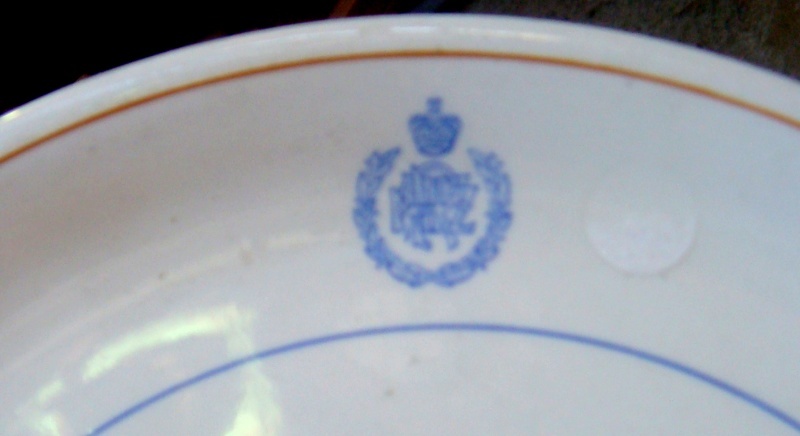 The Crown style indicates that it was made during King George V1 reign prior to 1953.
they say. Queen Elizabeth uses a different crown. They had thought that the number 87 related to the year of manufacture rather than the plate shape. 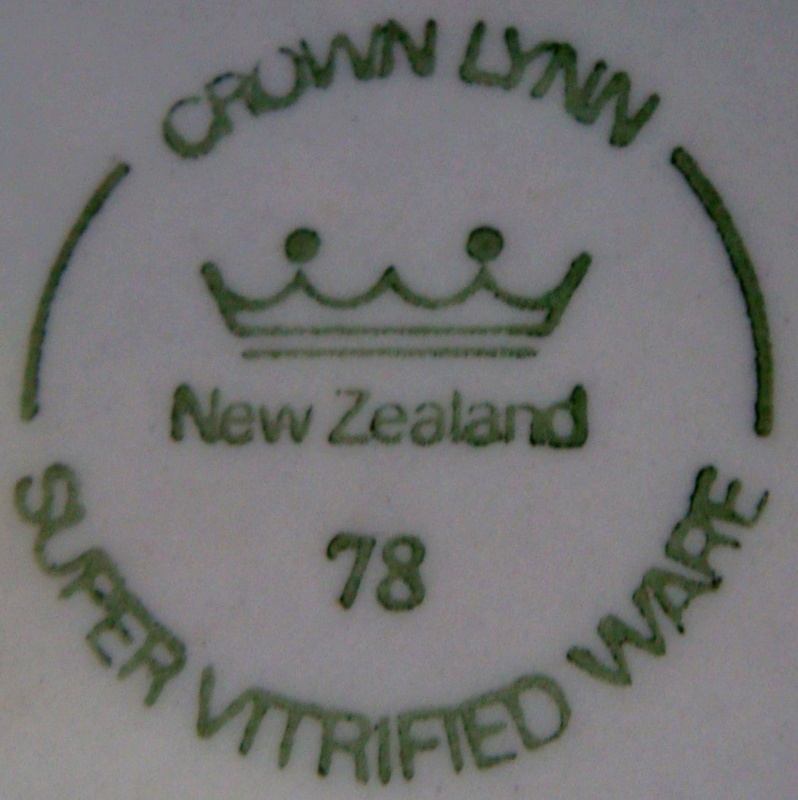 There is a big question mark over what the numbers on vitrified and supervitrified ware mean. Perhaps it has something to do with the clay used??? Or the firing???? But they both mention that the Trademark for that stamp was applied for in May 1955 ......... ?? So perhaps they were actually using this stamp way before they applied for the Trademark ??? Well they must have as 1953 was the cut off point for that crown !!!!!! 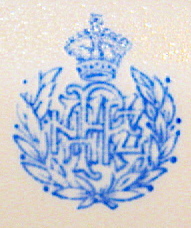 The use of the correct Crown style on insignias is very important to those involved as it is part of a long standing protocol and I would be very surprised if either the RNZAF or more likely the NZ Govt Stores Board who were the purchasing agents for all Govt departments in those days would make the error of using the wrong Crown after Elizabeth had been crowned. I have been collecting pieces with different shape numbers for some time and favour the theory that they do relate to the actual shape but we may never know. it is not surprising that we are puzzled. 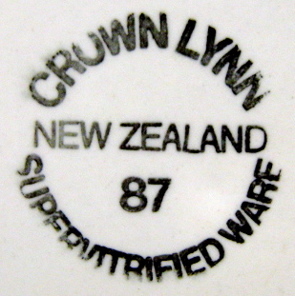 I always thought that the two digit printed or stamped number referred to the last two digits of the year of production - but I have no idea where I or why I came up with this belief - maybe someone in Auckland could speak directly to Alam Topham or Chris Whatsit at Studio Ceramics? Thanks Tony I will try to get in touch with Studio Ceramics next week. I think now is the right time to get to the bottom of the two numbers on the vitrified and supervitrified ware !! I will start a topic for discussion and would like as many examples as possible. Initially I thought the numbers referred to the glaze, but now I'm really not sure and I've never come across any reference re the numbers. 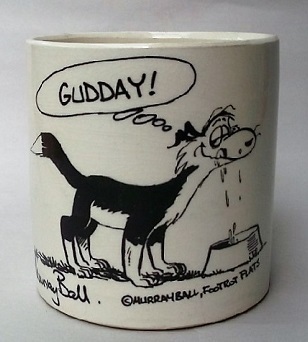 Chris Harvey has sold Studio Ceramics .... he had a stroke and I heard that he is now in a wheelchair : ( Yes, Alan Topham may know or have an idea...... ? 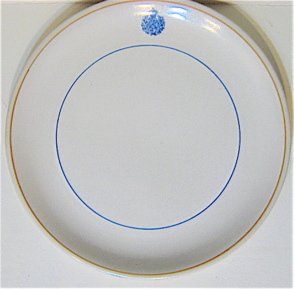 The backstamp on this plate looks very modern for a pre 1953 piece doesn't it? 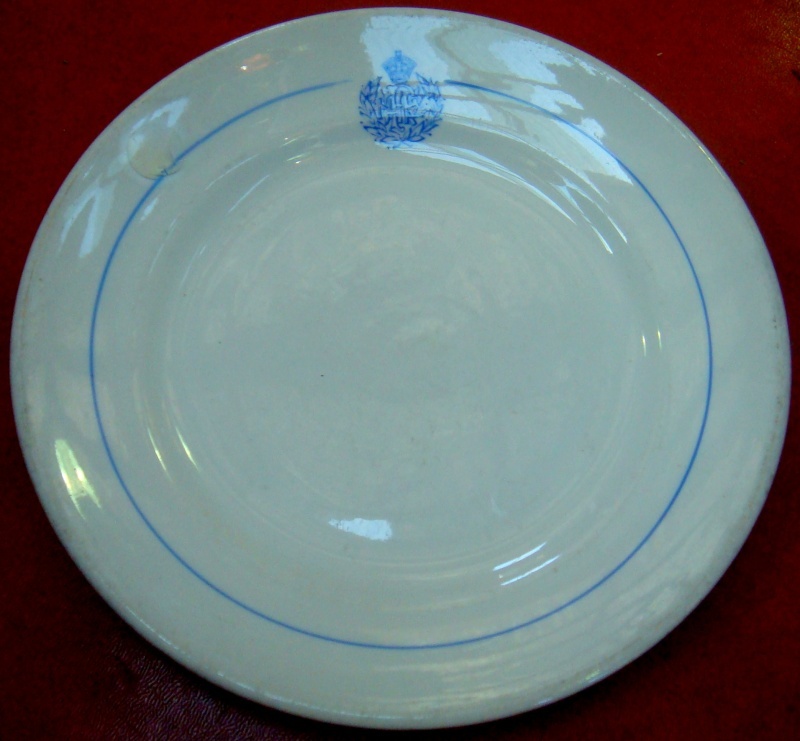 I think the plate looks very modern as well. and note that the handle is the old style block handle which may suggest that this cup and possibly the plate that started our search were made quite early in CL's history rather than later. Of course that is only a guess the handle may have been chosen as being less likely to break in use. Jonno, that is the Queen Elizabeth Crown .... so it would be from after 1953 presumably ...? I find it's so hard to date from shapes alone, as old shapes were used for many, many years. 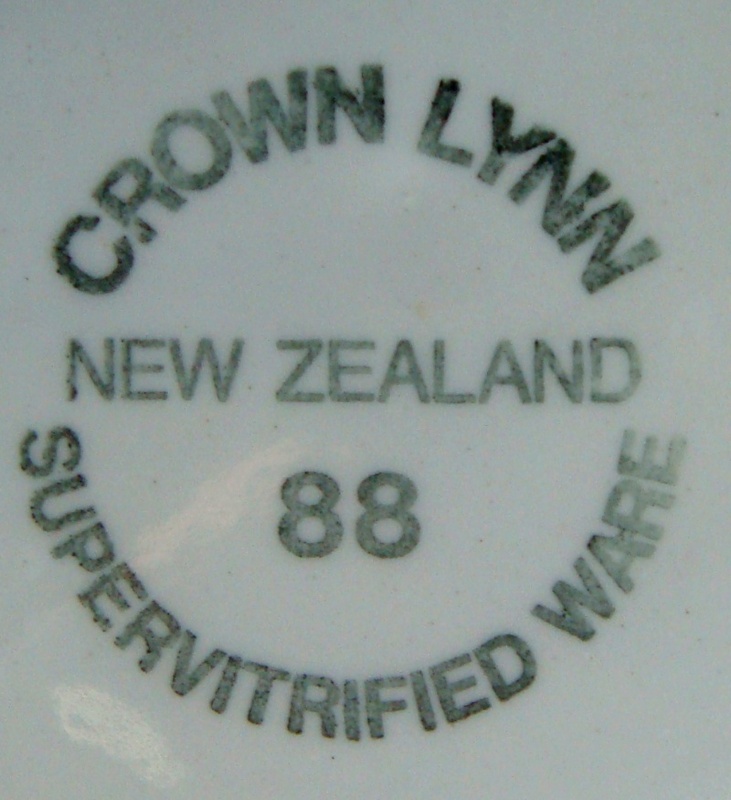 So the Super Vitrified Ware number is the year that the plate was made ..... 1987 then omgosh! 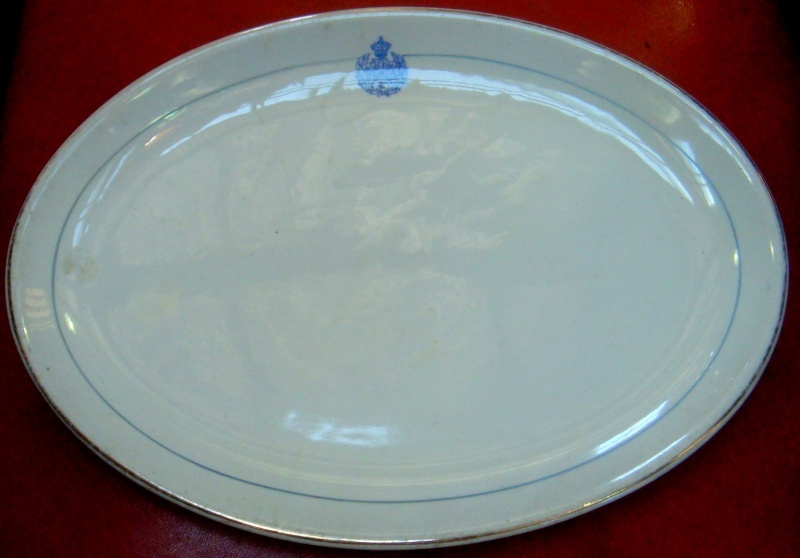 So the RNZAF Plate was made in 1987, I have 3 small sweets and a full dinner plate all 88 SVW which would have been made just before the end in May 1989 and at the other end of the time scale I have samples of 6,7,8,9 which are therefore from the sixties. Interesting , I am still puzzled as to why they felt they needed to put the year of manufacture on each SVW item. Off Topic , Have a new one for the gallery but still can't post the photos get a message that my file type is not acceptable. Will try again in the morning. Forma Filagree 600 can't see it on the gallery. 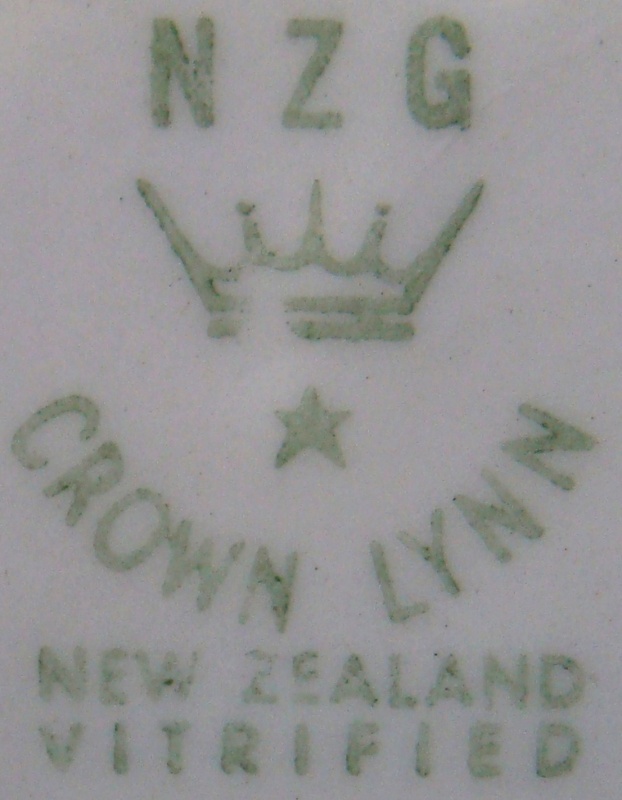 Also off topic but found a side plate today with the Capistrano design but with simple Crown ,Star,CL ,New Zealand BS in green which was from 1955 according to page 2 of the BS gallery. Curious. I can't work out why you cannot post pics atm ... but you can always email them to the site if you like. Hmmm going by Val Monk's Timeline, Capistrano was made in 1967 .... ? More to ponder about! Still waiting for confirmation regarding the single digit numbers ..... I see Reflections was put into production in 1959 ....? This saucer is very heavy, I reckon you would break a bone, if you dropped it on your foot !!! Fascinating to read back over the notes and comments in this thread, the info preserved on this site is one of the joys in belonging to it. Curiously I see I referred to the Farmer Christmas parade in one of my posts. and can confirm that it is on again this Sunday. 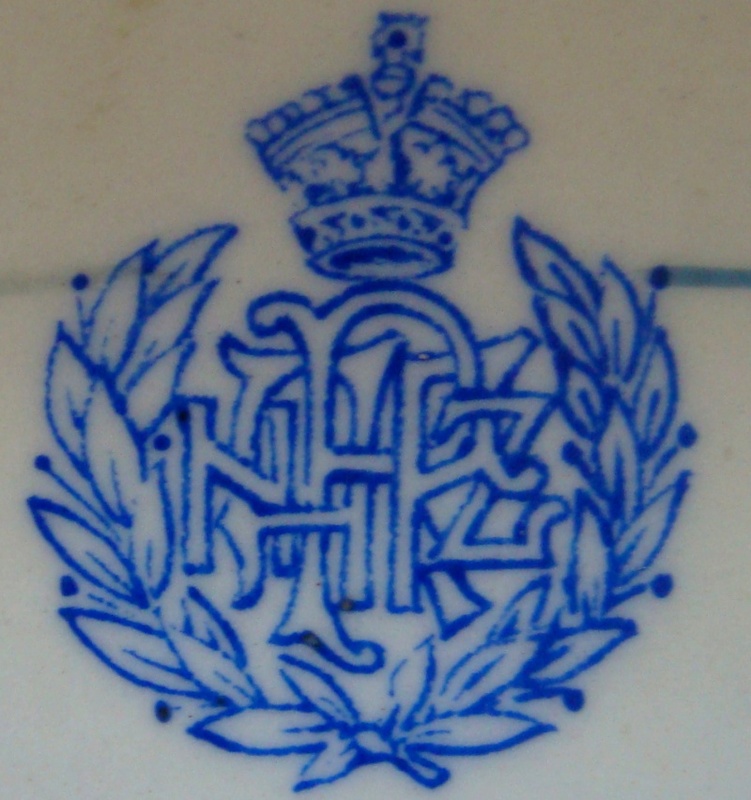 This looks to be the same momgram as Jonno's, and I found several different plates with this on yesterday, with different backstamps and dates too, so I thought I would share. No date on this, but an NZG stamp. There was also one with a 1975 stamp, so it seems these were made, probably in runs, from 1975 to 1988, so far.